It’s just been two weeks since we sent our last social media update newsletter, and so much has already changed. Keep reading to see what these changes mean for hotels and resorts in the hospitality industry, and don’t forget to keep an eye out for biweekly updates moving forward! We don’t want you to miss a single thing that could improve your hotel’s social performance, so we’ll be compiling bi-weekly lists of the most important changes happening on social media and how it will affect the hospitality industry. 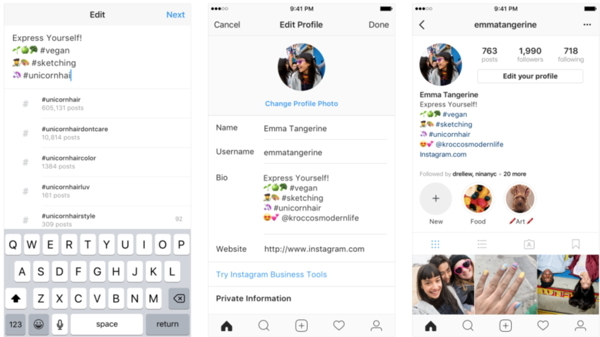 Instagram just released a new feature that allows users to attach links and actual, working hashtags to your profile. Many hotels will feature their branded hashtag in their profile, and now this will allow you to make that hashtag clickable.When it comes to the account links, you’ll be able to put links to other Instagram accounts in your resort’s bio. This includes linking to your hotel or resort’s other Instagram accounts. There’s two parts to this new update, and we’re going to break down what both mean for hotels and resorts. Being able to add an actual, clickable hashtag to your profile is a big deal, especially if your resort gets a lot of user-generated content. Imagine having a potential guest click on that hashtag and see not only posts that you’ve shared, but pictures of and videos of smiling guests enjoying splashing around in your oversized pool or raving about their spa weekend. This is immensely more persuasive what even the most talented strategists could create on their own. The account links also give hotels and resorts a distinct edge. Now, you can send users to other sister resorts and hotels if applicable. If your resort has separate accounts for your restaurant, spa, and/or wedding venue, this feature also gives you an excellent opportunity to promote those from your main profile, too. This will boost followers across the board on all accounts, and make your marketing seem a little more seamless. A good while back, Instagram caused a Facebook-eque when they announced that they would be rearranging the newsfeed. Since then, users are shown content that’s deemed to be most relevant to them, and it’s no longer in chronological order. Instagram will be changing this back to the way it was, focusing on newer posts. This is good news for hotels and resorts building up their following and engagement, as you’ll no longer get dinged by the algorithms. Make sure to find your peak posting times when your users are most likely to be online so you can post accordingly and get better results. In the meantime, post plenty of Stories, which last 24 hours. In our last newsletter, we talked about how Snap Map was expanding. Now, the Snap Map Explore feature lets users better see what’s going on around them by seeing where their friends are on the map. According to engadget, users will be able to see updates from their friends who have chosen to share their locations. If your target audience is active on Snapchat, this could be a big advantage for you. Imagine having users sharing stories and locations while they’re relaxing in the cabana or enjoying dinner in the resort. People at large conferences could be inspired to meet up with other attendees, for example, giving you a few extra heads during the dinner rush. Twitter is currently working on finding a way to scale that much-coveted blue checkmark, making verification more available to more users. Their verification system was originally created to help celebrities and influencers verify their identity and protect them from potential imposters or spammers. According to Business Insider, plan is to allow all users to access this feature to prove they are, indeed, who they say they are. Hotels and resorts who are not yet verified will be able to accomplish this much easier, getting a nice boost of credibility along the way. This will help customers feel more confident in who they’re engaging with, increasing the likelihood that they’ll reach out for help if they need it through Twitter’s messaging feature. Snapchat historically hasn’t done so well with providing businesses data about how users are interacting with their content, especially when compared to Facebook. They’re trying to compensate for that with their new location data, where they’ll offer brands free statistics about how many users are visiting their locations. According to AdWeek, the platform will soon be telling brands how many visitors came to their store, and how many came back at a later date. The data may even include information about demographics or users’ interests. Hotels and resorts are inherently location-based, and this update shows that Snapchat may be trying to take center stage as a location-based platform. This information, combined with a unique and highly engaged demographic that uses on Snapchat, could be an enormous advantage for those in the hospitality industry, especially if you want to learn more about your audience for future marketing campaigns. Subsrcibe Now – It’s Free & Never Miss an Issue. Headquartered in Parsippany, NJ, Lodging Interactive is a full-service digital marketing and social media engagement and reputation management agency exclusively servicing the hospitality industry. Through its web design and search optimization division as well as its CoMMingle Social Media Division, Lodging Interactive provides effective Internet marketing services to hundreds of branded and independent properties as well as management companies, restaurants and spas. 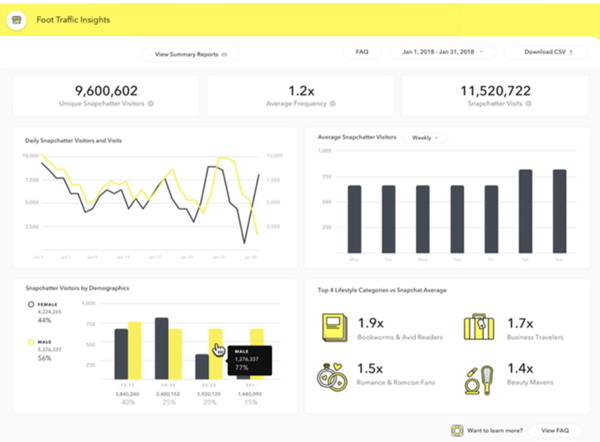 CoMMingle has established itself as the largest provider of reputation management services for the hospitality industry, handling over 200,000 guest review responses. The company also offers fully managed Live Chat agents for hotel websites through its LiveChatForHotels.com division. Lodging Interactive is an HSMAI Adrian Award winner and has won awards from the International Academy of Visual Arts, Interactive Media Awards, Horizon Interactive Awards, Web Marketing Association, Academy of Interactive & Visual Arts, and Travel Weekly’s Magellan Awards have recognized Lodging Interactive as an industry leader. Lodging Interactive is a proud supporter of the Hotel Sales & Marketing Association International (HSMAI) and the company’s president, DJ Vallauri, currently serves on the Board of Directors of HSMAI’s New York Chapter and is a Forbes.com Agency Council contributor. For more information, please contact sales@lodginginteractive.com, 877-291-4411 or visit the company’s website.